After dancing all my life, I turned to clay. My choreographing, performing and teaching children have definitely had an impact on my clay world. 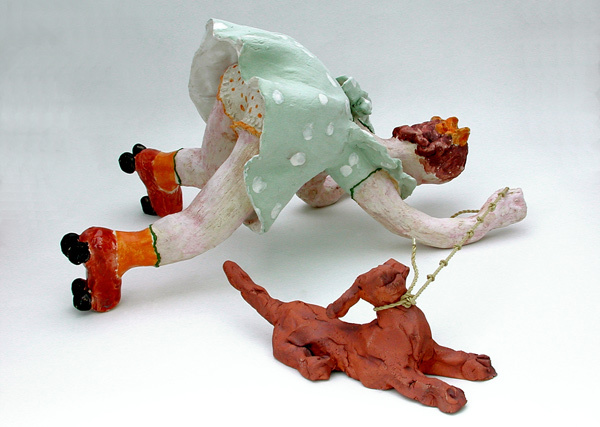 The themes I used and characters I portrayed in dance are now finding themselves in my ceramic sculptures and functional pottery. Hopefully they reflect the love, joy and playfulness I find in making them. I work with clay at different temperatures using both electric and raku kilns. Each piece dictates how it will be fired and glazed. Most of my pieces move or suggest movement from rocking horse tea pots to children swinging, dolls hanging, dresses evoking rhythms, to southern churches illuminated by candle light. My dance studio has now become a clay one and you may find me there happily improvising and creating one of a kind pieces looking for homes. 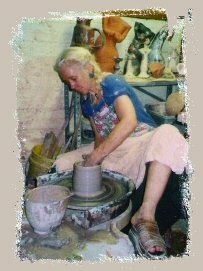 Donna Rizzo became a full time clay artist in 2002 after leaving a long career in dance. She has received both the Governors Award in the Arts (distinguished artist) and a Tennessee Arts Commission Individual Artist Grant. One of Donna's carousels was selected as 1 of 33 pieces for the 2010 Best of Tennessee Craft Exhibition. The items in my gallery are examples of work I continue to produce. If you are interested in one of the works here, they may or may not be available. In the case that they are not available I may have similar pieces that are. Please feel free to contact me!